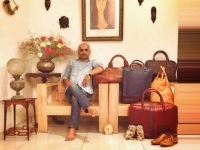 “Trunk-Call Talkies” is the entrepreneurial dream of its founder Rrajivv; who has been creating a limited edition of customized bags for its clients since its inception in 2011. The Brand "Trunk-Call Talkies" represents the Aesthetics and Sensibilities of a non-automated era. Our Brand Emblem the "Telephone Dial “ represents the Period Of Handwritten Letters, Post Offices, Telephone Booths, Radios. Similarly our Products are handcrafted with A lot of love, patience and care, Eventually becoming a part of one’s identity. I am lover of Vintage & Antiques, Old Vintage stuff inspires me , example : Manual Winding Clocks, Radios, Oil Lamps etc. The above things have discipline & love as part of their character. I started off my quest for making bags in 2011 and my first Collection came out in 2012 but it was not as per expectations, the my next collection got ready in 2013 It was better but still something was missing, then in 2014 my collection " Days Of The Raj" was closest to what i conceptualised was completed. I will be shipping my products within 2-4 days via reputed couriers. Kindly do not accept if the consignment appears damaged. My creations are delicately handcrafted. There may be minor variation between the image and the actual product. We do not accept returns.